Home birth is generally agreed to be a safe option for low-risk pregnancies. When I first contacted Lauren Clodi-Whitehead for an interview last year, she agreed without hesitation. Her only request was that we meet at a place where she could eat. And eat she did. While we talked, Clodi-Whitehead spooned sweet gelato into her mouth, a knit t-shirt stretched over her eight-months-pregnant belly. Clodi-Whitehead is one of many women, and men, across the country advocating for midwives and home birth options. Licensure for certified professional midwives is available in more than 20 states, but a national campaign called the Big Push for Midwives is working to inform, educate, and ultimately convince all 50 states to provide licensure for these birth specialists. Currently in Iowa the only midwives legally allowed to practice are certified nurse midwives (CNM). Because 98 percent of births attended by midwives occurred in hospitals (according to the most recent data from the American College of Nurse Midwives), little option is available for women who want to give birth in their homes. Which is exactly why Friends of Iowa Midwives was formed, to advocate for home birth options and midwives in Iowa. The group started in 2007 and is working to introduce a bill in the 2009 legislative session that would provide licensing for certified professional midwives (CPM) in Iowa. Proponents of home birth stress that this option is only beneficial for low-risk, normal births. And, as many have attested, home birth is a safe option for low-risk pregnancies. According to a 2005 prospective study published in the British Medical Journal, medical interventions—such as induction, episiotomy, electronic fetal monitoring, vacuum extraction, and caesarean section —were less than half as likely to appear in home births as hospital births. The study also reported that intrapartum and neonatal mortality rates were similar to those of low-risk hospital births. What’s more, midwives have a much better track record when it comes to caesarean sections. According to Lynne Himmelreich, an RN and CNM at the University of Iowa Hospitals and Clinics, the national c-section rate is 31.8 percent. That means that one in three births are delivered via surgery. The midwives at UIHC boast a much lower c-section rate of 13 percent. Kathleen McCormick-Deol, a CNM in Iowa City who specializes in home birth, beats both rates with less than 5 percent of her deliveries resulting in caesarean sections. Himmelreich spent 22 years as an in-patient delivery nurse before becoming a CNM. She is quick to state that she is not anti-physician, nor is she against home birth. But she does have concerns about the standards CPMs would have to exhibit in order to be licensed in the state. Himmelreich also serves on the board of directors for the American College of Nurse Midwives, the organization that oversees the CNM credential. “We don’t feel you need to be a nurse,” she said. “But you do need an academic education.” In her view, CPMs are not all created equal. 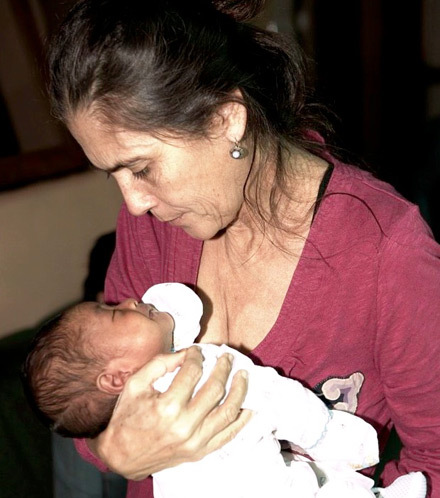 McCormick-Deol is one of two or three CNMs in Iowa who attends home births. Her calendar is booked through the year with women who want to have their babies at home. Monica Brasile, a childbirth educator and activist with Friends of Iowa Midwives, said that in addition to the nursing degree, there is another key difference between nurse midwives and professional midwives—the latter are required to have clinical experience in in-home settings. From Brasile’s perspective, an academic background in midwifery isn’t as important as clinical experience because all CPMs must pass the same certification exam. She explained that Iowa would most likely incorporate the CPM certification as the standard. “That’s been the trend in other states that have licensed direct-entry midwives,” she said. Clodi-Whitehead is looking forward to the legislative campaign led by Friends of Iowa Midwives, even though it might be a challenge with an infant. When we last spoke, she held her daughter. who screeched and gurgled the whole time with ease. Direct-entry midwives train in home birth settings with experienced midwives. They are not overseen by any organization. Certified professional midwives (CPMs) must meet the training standards required by the North American Registry of Midwives. A CPM is the only credential that requires out-of-hospital training. Certified midwives (CMs) are recognized by the American College of Nurse-Midwives after completing an accredited program. Certified nurse midwives (CNMs) are registered nurses who have graduated from a nurse-midwifery program recognized by the American College of Nurse-Midwives, and have passed the certification test administered by the American Midwifery Certification Board.